Today is New Year's Day in Korea and I suppose a very good day to get started on my resolution - to blog more. And I couldn't think of a better topic to re-start with than the birth of our second baby boy. 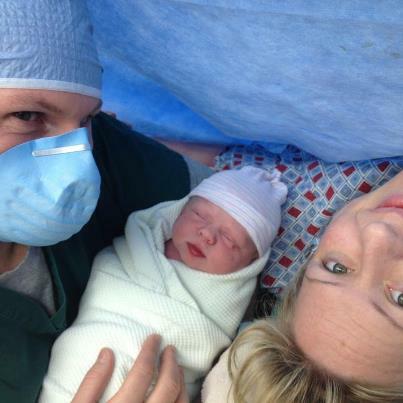 So without further adieu .. we're thrilled to introduce Spencer Duke Hein! Born on December 21st at 8:14am in Seoul, Korea at the Brian Allgood Army Hospital. Weighing 8 pounds and 5.2 ounces and measuring 19.5 inches long. This pic was taken by one of the OR nurses only about 10 minutes after Spencer was born. I was still on the operating table. And me and Spencer only 2 1/2 hours before Spencer was born. Daddy in his nifty OR scrubs - in just a few minutes they roll me into the OR for the spinal and to prep for surgery. My OR team was fantastic and helped me keep as calm as I could be. The spinal was really easy and I appreciated that my team was completely focused on me and my surgery (vs talking about what they were going to have for lunch). During my last C-section there were over 20 people in the room for a teaching opportunity so I also liked the smaller team. Cooper was delivered extremely quickly but Spencer took a while longer so Owen was able to see much more of the surgery this time (kudos for not passing out!). When he was finally delivered and started to cry is when I felt that rush of overwhelming emotion. It felt like ages until I could hold him but it was worth the wait. ... And welcome to the world! Just a few minutes after Spencer was born. Another photo that I didn't get to see until much later - Spencer's first bath. I was still in recovery at this point but Owen was with him the entire time. Cooper meeting Spencer for the first time. Cooper gave Spencer the little bear and Spencer gave Cooper a train - Cooper liked Spence immediately! Cooper took to Spencer very quickly. This was the very first shots of Cooper getting to hold his new baby brother and he's very excited! Cooper giving Spencer baby brother kisses. Heartbreakingly sweet. 3rd day in the hospital before being discharged. Spencer loves having his hands free and in his mouth. We have a GREAT sleeper on our hands - yay! Spencer's middle name is short for my maiden name - Dukatnik. My big brother went by Duke in the Army and my dad even had a band called the Duke Brother's growing up. Cooper's middle name is a family named passed down on Owen's side so we wanted Cooper to have that connection on my side. Plus, Duke is just cool.